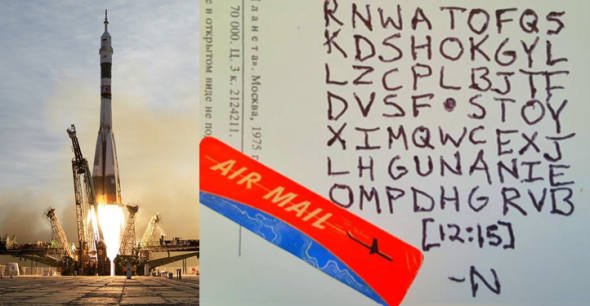 50 postcards written by two aerospace technicians in 1968 contain encrypted and hidden messages. If you want to solve them you should listen to “The Soyuz Files” podcast. This is the introduction of the interactive podcast The Soyuz Files. Of course, the story of Jacob and Nikolai isn’t real. It was invented by the creators of the podcast, Spencer Devlin Howard and Nathan Turner of the Los Angeles-based multimedia storytelling collective The West. However, Howard and Turner did their best in order to make this game look authentic. 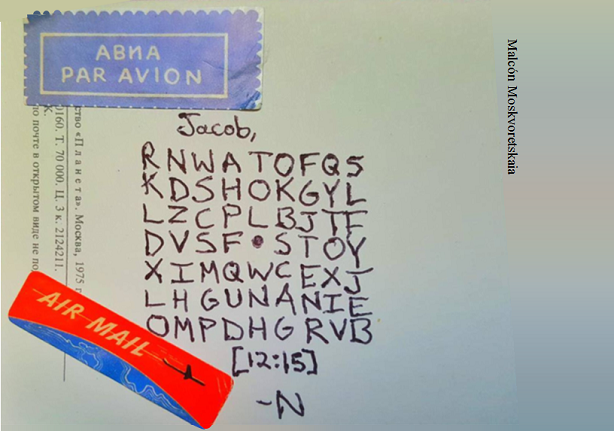 It features real postcards, radio broadcasts, and a number of hidden or encrypted messages. 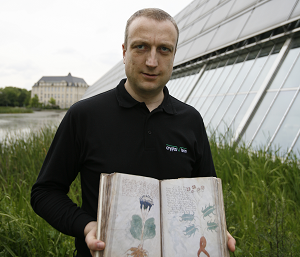 The Soyuz Files website lists 50 postcards written by Jacob and Nikolai, all of them dated 1968. Can a reader solve it? I don’t know if it is even possible without having additional clues given elsewhere in the game. I haven’t taken part in The Soyuz Files game so far, but it’s sounds very interesting to me. Especially, I like the concept. An interactive podcast can be thought of as an online version of an escape room. It is similar as or a type of an alternate reality game. If an interactive podcast features cryptographic challenges, like this one, it is also related to a crypo puzzle page, like Mystery Twister C3. If a reader is taking part in the Soyuz Files (maybe this blog post will encourage some to join), I would be interested in learning about his or her experiences. This postcard was printed in 1975, hence the cipher cannot have been written in 1968! With a dot in the middle and a square formation, that looks like a “Grille”. You’re right, this must be the solution.